We back up your Pro Managed WordPress sites every day. As long as you have at least one backup, you can restore the site. Note: Pro accounts are available only in the United States and Cananda. To restore a Managed WordPress site for a Basic, Deluxe, Ultimate, or Developer account, see these instructions instead. 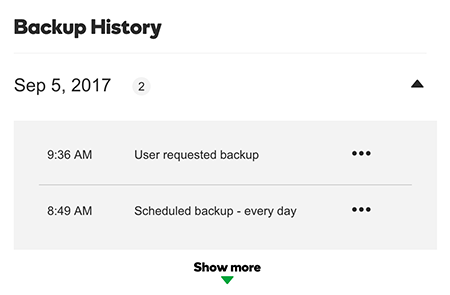 Warning: Restoring a site from a backup erases all changes you've made since the backup file was created. For the website you want to restore, click the three-dot icon and select Settings. 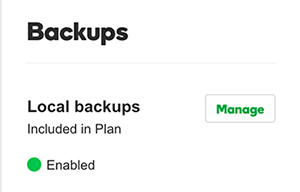 In the Backup History list, click the three-dot icon for the backup you want to use, and then select Restore. You might need to click the triangle to expand the list of backups to find the one you want. In the Choose a restore type... list, select Restore all and then click Next. One last chance to change your mind! If you're sure you want to restore the site, click Start Restore. If not, click Cancel. While the site is being restored, you can click Back to All Sites to go back to the WordPress Sites list.